The wait for the third edition of the Pakistan Super League (PSL) is almost over. But, before the cricket action begins on February 22, a ceremony will be held in Dubai tomorrow to unveil the trophy of PSL 3. The Trophy for the tournament will be unveiled to the public at the Dubai International Stadium. Then, the trophy will be taken to the headquarters through from where it will be received by the captains of the PSL teams. The Captain of defending champion, Peshawar Zalmi, Darren Sammy, will take the trophy to the ceremony. In a video interview before the third edition of the Pakistan Super League, the former captain of the Windies praised the revival of international cricket in Pakistan and recalled his memories of PSL last year. 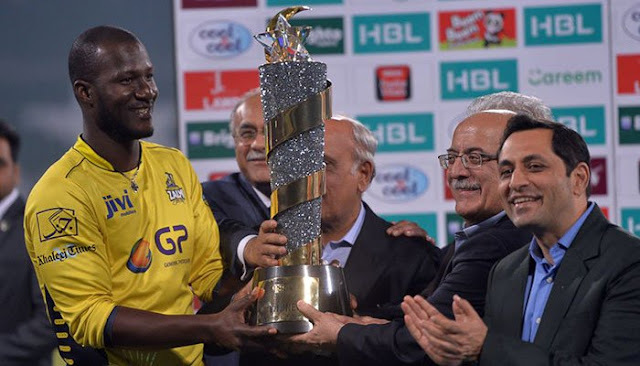 "We had to see bright scenes at the Gaddafi Stadium in Lahore, everyone had the Zalmi flag," Sammy recalled PSL 2, as he expressed his gratitude to the Pakistani crowd. "It's time I gave them back their love." We lifted the trophy in Lahore last year, we will raise it again in Karachi on March 25." The event will be attended by managers and owners of the PSL franchises, along with senior officials of the Pakistan Cricket Board. The defending champions Peshawar Zalmi play debutants Multan Sultans in the opening match of PSL 3 on February 22 in Dubai.